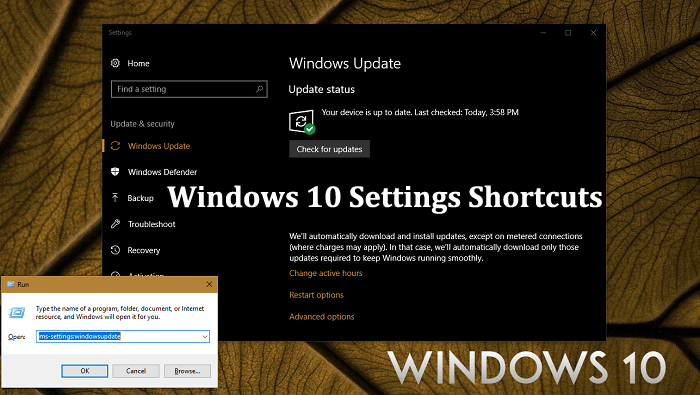 Want to know about Windows 10 settings shortcuts? In this post, you will find out some of them using which you can open different Settings pages without opening a Settings app. Windows 10 included lots of new things and one out of them is the Settings app. The company introduced a new Settings app to ditch its classic Control Panel. It had various pages and derived a lot from old settings. Settings app includes lots of settings, and each of them has its particular URI which means Uniform Resource Identifier. With the help of URI, the Windows 10 users can launch any Settings app right away with the help of individual commands a.k.a Settings shortcuts. Lots of users want to know about these Windows 10 Settings shortcuts. To help those users I decided to write this post in which you will read about all the Settings pages URI (ms-settings) exist in Windows 10. For example, “ms-settings:windowsupdate” this is a page URI for opening Windows Update settings page straight. Once you type or paste this command in the dialog box and press OK, it will directly launch the settings page of Windows update. As of writing this post, there is no ms-settings or URI available for opening Windows Defender setting which is weird. Maybe in Windows 10 fall creator update, the company include the same URI too. Why don’t you try these useful Windows 10 settings shortcuts or URI command to quickly launch the settings pages directly? In case, you find that I forget to mention any URI, then feel free to share it in the comments. I will update them in my list to that other users can take advantage of it.